THE END OF THE GOLDSTREAM Salmon Run is a signal to the Bald Eagles that it is time to return to Goldstream for their annual salmon feast. Record numbers of Bald Eagles have been returning to the park - up to 276 in one day! - for the past three winters. By closing the estuary to people, the birds can feed undisturbed while visitors are able to see them up close with the use of a video camera and telescopes. This protective measure has proven extremely effective. This winter, from early December until late January, Goldstream Provincial Park's Visitor Centre will be celebrating the return of the Bald Eagles with special programs and exhibits focusing on birds of prey. Keeping the visitor centre open at this time of year is due entirely to public support from donations at the door! School programs by donation occur throughout the week (teachers must book ahead). Check out the exciting weekend and holiday activities as well (yes, something for the kids when school is out)! In the winter of 1990-1991, a quiet zone was created on the lower stretch of the Goldstream River. This Quiet Zone resulted in increasing numbers of Bald Eagles. Four years later, in the fall of 1994, a Black Bear entered the estuary to feed on the salmon. Rather than removing the Black Bear, the estuary was closed off to the public for the duration of the salmon run. The absence of people in the area also provided eagles with a place to feed; free from human interruption. Since closing off the estuary, the number of eagles feeding on the salmon carcasses has risen from a yearly high of 12 to one of 276. More recently, the estuary has been closed all year round, a conservation strategy which has encouraged a pair of eagles to nest here as well. 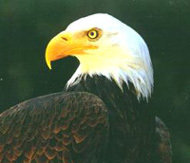 Even a single hiker or kayaker can cause the eagles to fly to safety and miss one of their daily meals. Please help us ensure that eagles continue to return to Goldstream by respecting the signs around the estuary. It is possible to get a better look at the eagles through the video camera or spotting scope. Please ask one of the staff to operate the video camera. 1. Bring binoculars and a camera. Because of changes in the way BC Parks manages the estuary, the Bald Eagles and other birds of prey are more visible than ever before! 2. Keep out of the estuary and quiet zone along the river - these areas have been set aside for wildlife. Please pass the word on to kayakers and other boaters. 4. Definitely ask a naturalist to show you the new Bald Eagle nest using a telescope or the video camera. 6. Use the viewing platform to get as close as possible to the eagles. Be sure to approach it slowly and quietly. Small children can see better up on your shoulders. 7. The best time to view undisturbed eagle feeding behavior is during a low tide, which is usually in the morning during the winter. More eagles are visible and can be observed on the mud flats. 8. Leave your dog at home. If you do decide to bring a dog it must be on a leash and on the trails. 9. Do not leave your wallet, purse or other valuables in your car. Visit the park again in the spring to mark the progress of the Bald Eagle nesting season and to participate in some of our other special events!